In the mid-nineteenth century, a group of radical socialists known as the Forty-Eighters brought their views to the United States, seeking to change its government and society. These advocates of big government supported the ideologies of Abraham Lincoln and endorsed him as a presidential candidate. This compelling book follows the rise of the early Republican Party, describing how a group of extreme socialists set the tone for today's Leviathan government. Eighteen chapters offer an in-depth explanation of the Forty-Eighters, noting their origins in Europe, where the socialist revolutions took place; their influence on the election of 1861; and their role in the Union army. Sections question the high regard that such communists as Karl Marx and Fredrick Engels held for Lincoln. 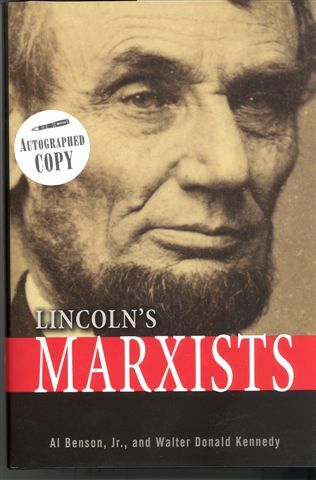 Lincoln's Marxists also scrutinizes Lincoln's religious views, disputing the common belief that he was a pious Christian. Addenda include profiles of early American communists and socialists, an article on twenty-first century secession movements, and a recommended reading list. Pictures of historical figures provide a visual reference. Through cogent examinations, the authors reveal a side of Abraham Lincoln's life that has remained shrouded in obscurity. Al Benson, Jr., is the editor and publisher of the Copperhead Chronicle, a newsletter that presents history from a pro-Southern and Christian perspective. In addition to writing for Southern Patriot and other publications, he is a member of the Confederate Society of America and the League of the South. Benson resides in Sterlington, Louisiana. Walter Donald Kennedy is an outspoken advocate of limited government and states' rights. He continues to engage his audience at Tea Party events and Southern heritage conferences throughout the country. In addition to contributing articles to numerous publications, he has appeared on such television programs as Bill Maher's Politically Incorrect. He is the coauthor of the best-selling The South Was Right!, Was Jefferson Davis Right?, Why Not Freedom! America's Revolt Against Big Government, and Nullifying Tyranny: Creating Moral Communities in an Immoral Society and the author of Myths of American Slavery, all published by Pelican. Kennedy lives in Downsville, Louisiana. "The Union is Dissolved!" This was the Charleston Mercury headline for the evening of December 20, 1860. South Carolina had seceded from the Union. The United States were no longer united and would never be truly united again. South Carolina and the 10 other Southern states who followed her in seceding from the Union were not traitors. Each state belonging to the Confederacy had left the old Union the same way it had joined - by majority vote of elected representatives. According to our founding fathers and authors Walter D. Kennedy and Al Benson, Jr., Red Republicans and Lincoln's Marxists, Southerners were simply exercising their Constitutional right to form a new government. By the late 1850s, the heavily populated, mostly industrial Northern states were trying to expand the powers of the federal government in order to benefit their industrial benefactors. This they did at the expense of the less populated, mostly agricultural Southern states. After the 1860 election of a big government radical who promised numerous unconstitutional changes, 11 Southern states decided it was time to form a new nation, one whose federal government did not exceed the powers granted it by their constitution - which, by the way - was nearly identical to the old one. There was one difference, as Kennedy and Benson point out. Northern banks and businesses profiting in slavery had refused to allow an end to their profitable African slave trade. The Confederacy put an end it. Those who claim Southerners left the Union because they feared Mr. Lincoln might end slavery argue a lie that has been propagated for 145 years. The so-called Civil War was never about slavery, and Mr. Lincoln's all-powerful federal government didn't free the slaves. It bought them. Kennedy and Benson's research reveals some remarkable facts about Abe Lincoln, his political party and his genocidal army. Lincoln and his party, ironically called Republican, didn't interpret the Constitution the same way our founding fathers did and were willing to do whatever was necessary to put an end to "states' rights," even if it meant killing every Southern man, woman and child, white or black, free or slave. A republic is a nation ruled by law, but the new Republican Party and its leaders would prove to be contemptuous of both state and federal law, especially the U.S. Constitution. And as Kennedy and Benson discovered, those who formed the basis of the Republican Party had a lot to do with its big government ideology. In 1848 there were 18 socialist/communist uprisings throughout Europe, uprisings that had the sympathy of a young lawyer in Illinois. These revolutions all failed, so their leaders fled Europe for the refuge of the United States, settling primarily in the northeast and Midwest, taking occupations in journalism, education and politics - the same professions still dominated by leftwing radicals today. Google the names Friedrich Anneke, Carl Schurz, Franz Sigel or Joseph Weydemeyer, and see what information you get. These socialists/communists had no love for the U.S. Constitution and only venomous loathing for the Holy Bible, but they made this country their home and the new Republican Party their party. Many of these "Forty-Eighters" were protégés of Fredrick Engels and Karl Marx himself, who wrote at least two letters to Comrade Lincoln and even wrote a eulogy for him upon his assassination. I've read where three of every five Southern men who survived the war at all were missing an arm, leg, eye or some other body part. Many returned home to no home at all, finding it either burned or confiscated by carpetbaggers or scallywags. To add to this insult, what families could be re-united found their children being herded off to public schools where they could be re-educated, "cured" of the thought crimes of believing in states' rights or any other strict interpretation of the U.S. Constitution and especially the Holy Bible. For all our losses though, Northerners actually lost more. That's right. I'm not talking about the fact that they suffered more battle casualties. The people in the supposedly victorious North to this day think they won something, when in fact they lost everything. Their precious Union died that December evening in 1860 and despite the best efforts of their bloody bayonets, there is still no unity! Oh, and they didn't free the slaves either. They joined them. 1. An indivisible, all-powerful federal government. States' rights? 2. A heavy, progressive income tax. "From each according to his ability to each according to his need." 3. Abolition of property in land and application of all rents of land to public purposes. What happens when you don't pay your property tax? To whom then does "your" property really belong? 4. Free and compulsory public education. Google Legally STUPiD. See what I mean! Buy a copy of Red Republicans and learn the truth you'll never read in a newspaper, hear on network news or learn about in public schools. I can't say enough to commend all the scholarship behind this book, and I encourage every freedom-loving American to read it.